1993. Teenager Cameron Post (Chloë Grace Moretz) is caught in the back of a car with her high school prom queen, leading her strictly religious aunt to send her to a gay conversion therapy centre to be ‘cured’. Once there she teams up with two new friends to subvert and challenge the system. Gay conversion camps were famously tackled in Jamie Babbit’s 1999 comedy But I’m a Cheerleader, and to be honest that likely remains the gold standard for that specific subject matter. The Miseducation of Cameron Post, however, successfully carves out its own niche: a little more dramatic, and powerfully performed, it tackles difficult and often unpleasant subject matter with humanity and a strong sense of social justice. Let us not mince words: conversion camps are abhorrent things, effectively kidnapping young adults in the most vulnerable of states, further fracturing their unsteady senses of self-esteem, and subjecting them to a form of active psychological torture. It is a worthy and important subject for a feature film, but it is also one that brings responsibility onto the writers and director to treat the issues with intelligence and respect. Director Desiree Akhavan – who also co-writes with Cecilia Frugiuele – does so extremely well. The film leavens the drama with humour, which feels genuine and enormously welcome. At its most serious the film covers extremely dark and confronting material of self-harm and homophobia, and some viewers may struggle with it a little. That in mind, it is especially important to balance it with lighter moments and a sense of hope to make the story digestible. Akhavan keeps the story intimate and personal as well, focusing primary on Cameron herself and a limited number of fellow residents in the camp. There is more than a little of John Hughes in how the story is expressed. Chloë Grace Moretz is superb, crafting yet another strong lead performance in a growing career of them. She has fast developed her reputation as one of America’s finest young actors, and continues her work here with a subtle and naturalistic performance. The key to the film’s success is in how it treats Cameron. It does not judge her. It does not deify her. It does not even make an aggressive argument for the injustice of ‘gay conversion’ schemes. It simply showcases the effect of such schemes of LGBTIQA youth, and allows the audience to make the obvious arguments by themselves. The supporting cast is excellent. Forrest Goodluck plays Adam Red Eagle, whose father – moving into politics – has found his child’s non-binary gender unsuitable for his desired public image. Sasha Lane plays Jane, Adam’s best friend who is growing a secret stash of marijuana in the woods outside of the treatment centre. Together the three leads bring a lot of charm and appeal to their roles. John Gallagher Jr plays Rick, the centre’s resident priest who helps operate the camp. Gallagher is superb, managing to play a multi-faceted character that is likeable and reprehensible in equal measure. What he does is appalling, but by the film’s conclusion he seems as much a victim as any of the young adult to whom he preaches. As psychologist Lydia Mach, Jennifer Ehle provides the film with the closest thing to a villain that it has; but even then one wonders how much she has simply been corrupted by her own religious beliefs. The Miseducation of Cameron Post is a strong feature drama on every front. Good acting, direction, and most importantly a vital subject matter. These conversion camps and centres are fundamentally ugly and inhumane places. That they exist should be criminal. In the USA they are still inexplicable legal in the majority of states. 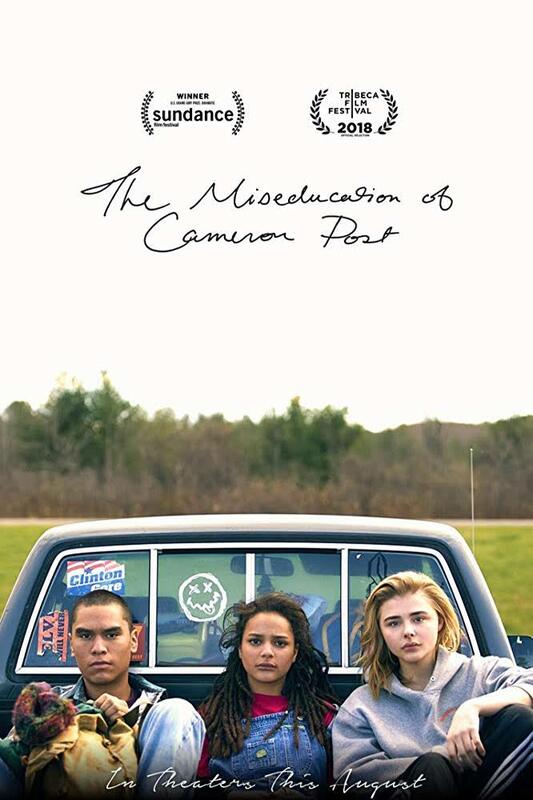 The Miseducation of Cameron Post was featured at the 2018 Melbourne International Film Festival. It opens theatrically in Australian cinemas on 6 September 2018. I feel that the line “a young man whose own non-binary gender saw him sent there by a politician father” needs either a correction or an explanation, because at the moment it reads very wrongly. I’m open to suggestions but will have a look. You know my intentions.